Trezor VS Ledger: Which one should you buy? Hardware wallets are the safest way to store your crypto. Period. HOWEVER, if you chose the wrong hardware wallet, the risk of losing your coins remains. Most people chose either a Trezor One or a Ledger Nano S as their first hardware wallet. That’s the question we answer in this review. Let’s dive right into it. Created by SatoshiLabs, and launched back in 2013, the Trezor became the first cryptocurrency hardware wallet to hit the market, and became an instant success among early adopters thanks to the huge leap in security it provided over other cold storage solutions available at the time. Before the Trezor, the only way to store your cryptocurrencies in an offline environment was using a paper wallet, which required you to print and store your private key on paper — a practice now considered obsolete thanks to the advent of the Trezor. The Ledger Nano S, despite launching three years after the Trezor quickly took the market by storm, in part due to its affordability, but also thanks to the impressive number of altcoins it supports, since these were largely gaining traction at the time of its release. Today, despite the increased competition from a new wave of hardware wallets, both the Trezor One and Ledger Nano S still remain a popular choice, having been battle-tested for several years and greatly expanded in capability since launch. Since the early days, hardware wallets such as the Trezor and Ledger have gone beyond simply storing Bitcoin (BTC), to storing potentially thousands of digital assets, non-fungible collectible tokens (NFTs) and even passwords, thanks to an ever-increasing array of apps the wallets now work with. In our Ledger Nano S and Trezor One review, we will break down the key characteristics of the world’s most popular hardware wallets, digging deep to extract the information you need to make this all-important decision. After all, if this is going to be the device you potentially store your entire portfolio on, it had better tick all the right boxes, right? How do both the Ledger Nano S and the Trezor One stack up when it comes to security, compatibility, value for money and more? Which is better? Trezor vs Ledger. Let’s find out. Both the Trezor One and the Ledger Nano S are an excellent choice as far as security is concerned, with both being practically invulnerable to hacking. 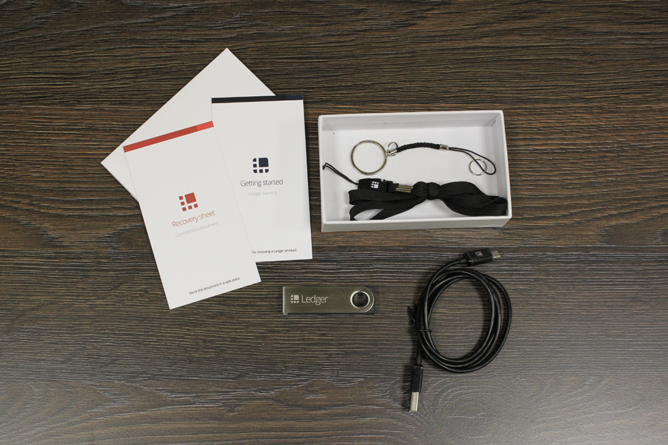 The Ledger Nano S is unique as a hardware wallet since it features a secure element that is isolated from external attacks. Since your private key is stored on this secure element, it is physically isolated from both the outside world and the online environment, reducing the number of attack surfaces to a minimum. The Trezor does not use a secure element to achieve its security, since Trezor wanted to ensure its hardware wallet is open source. 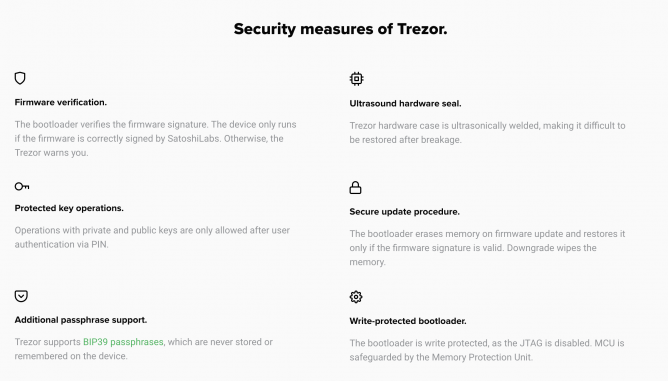 Instead, to protect your private keys the Trezor includes a write-protected bootloader and firmware verification, warning you if either is compromised. Beyond this, both the Ledger and Trezor wallets use PIN protection to prevent unauthorized access, and feature a built in screen to show your recovery phrase, allowing this to be backed up offline. On a side note, both the Trezor and Ledger ship with a recovery card, which can be used to backup your seed phrase, and stored in a safe place. The Ledger Nano S has also been shown to be waterproof, though this is not a guaranteed feature of the device. The Trezor is also water resistant, but we wouldn’t recommend testing the limits of this designation. Comparing the security the devices, we find that both offer robust protection against a variety of attacks, though the Trezor has been around much longer, and can be considered the more battle-tested of the two. While the hardware wallet is used to confirm and authorize transactions, the great majority of the interaction is actually handled through associated applications — namely the Ledger Live and Trezor Bridge software. Both Trezor Bridge and Ledger Live are clearly designed with usability in mind, with everything laid out with a clear direction, ensuring even less experienced investors can get around easily. Although they both function to help you send, receive and sign payments, they also provide helpful charts that show how your portfolio has changed in value over time. Both wallets also let you separate your money into multiple accounts, helping you better manage your money and budget. 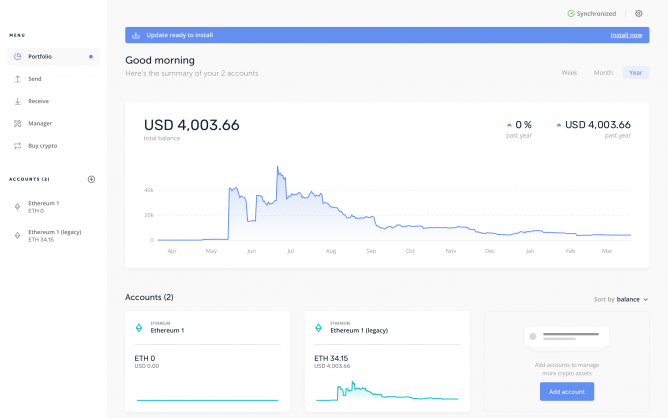 Ledger Live also includes an exchange section, helping you easily exchange your cryptocurrencies through a variety of external platforms. The Trezor software, however, does not offer this feature, being the more basic of the two. Both the Ledger and Trezor are compatible with a wide variety of operating systems, including Windows, MacOS and Linux. They can also both be used with mobile devices through either Android or iOS, but doing so will require an OTG-compatible device, as well as an OTG cable which is typically sold separately. One of the most important considerations to make when selecting the best hardware wallet for you is the type and number of coins it supports. 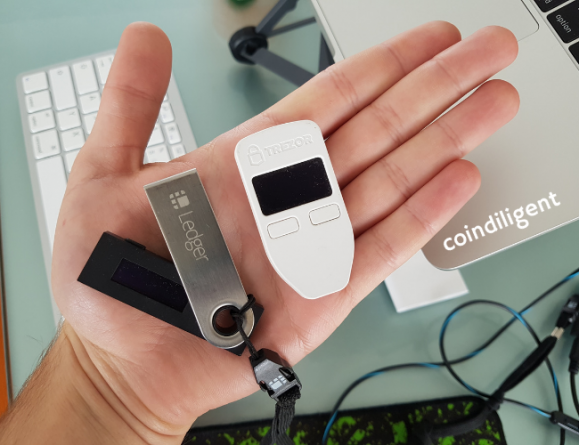 Luckily, both the Trezor and Ledger wallets feature an ample selection of supported assets, but subtle variations may sway you in one direction or the other. In total, the Ledger Nano S supports 75 different coins, and over 1,100 tokens. 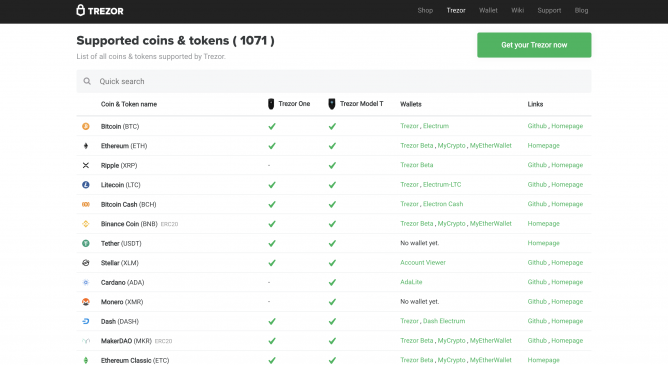 The Trezor One, on the other hand, supports slightly more coins, at over 85, plus all ERC20 tokens, allowing users to add any ERC20 tokens that are not supported by default. Both of these values are current as of writing (March 2019). 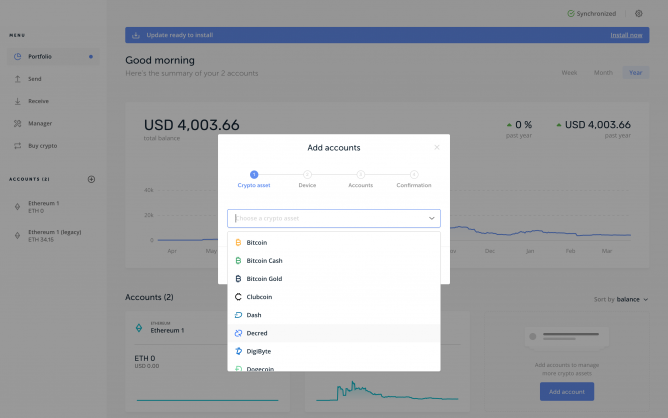 Note that the Ledger does not natively support ERC20 tokens, but instead offers ERC20 storage through its integration with a third-party wallet offered by MyEtherWallet. Trezor, however, does feature native support for tokens. For many proof-of-stake (PoS) coins, neither the Ledger or the Trezor allow staking. However, some coins such as Ontology (ONT), Ark (ARK), can be staked on the Nano S, whereas Tezos (XTZ) can be staked on both wallets. The Ledger Nano S also enables NEO holders to generate GAS by creating a wallet using the NEO wallet app. 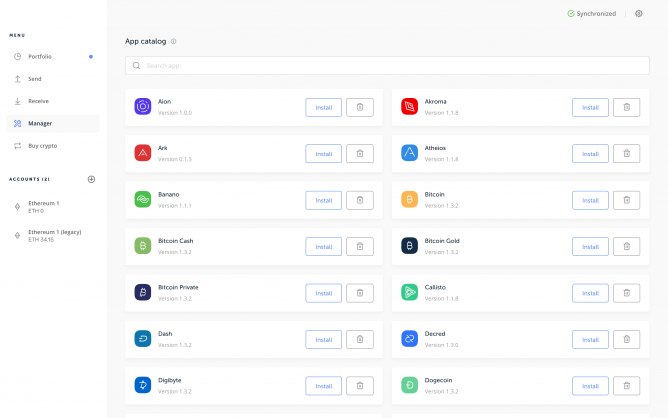 In addition to this, since both wallets work with MyEtherWallet, but will allow users to interact with Ethereum DApps, allowing users to make the most of their portfolio. Despite being built around simplicity, some people will inevitably run into a hitch or will need assistance using or setting up their hardware wallet. 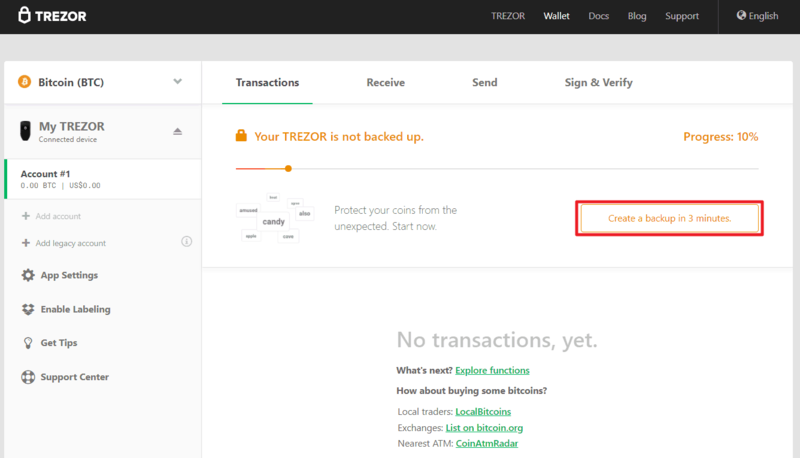 Therefore, when comparing Trezor VS Ledger it’s crucial to also take a look at the customer support. The last thing anybody wants, is to have an issue with a product and receive poor, or no customer support when it matters most. Luckily, this is unlikely to be the case with either the Trezor or Ledger wallets, since both are renowned for responding to customer queries promptly. 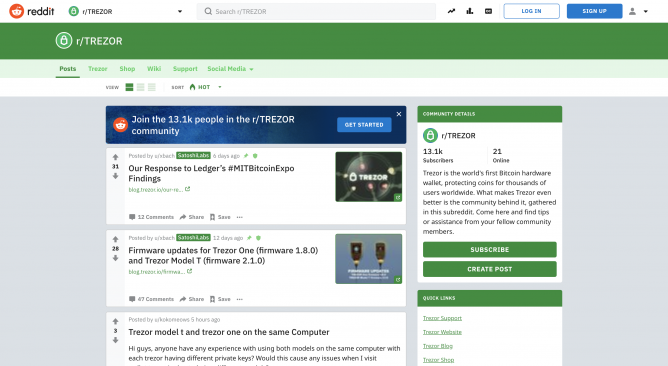 If your problem is a common concern, you may find the answer in the Ledger help center, whereas the Trezor maintains a comprehensive wiki, which includes an extensive user manual, FAQ and security guide. Unfortunately, neither Ledger nor Trezor offer telephone support. Instead, Ledger provides support through its online form, Twitter and a live chat function, whereas Trezor offers support through an online form, the Trezor subreddit, and through an online troubleshooter, which helps you work through many issues using an automated process. 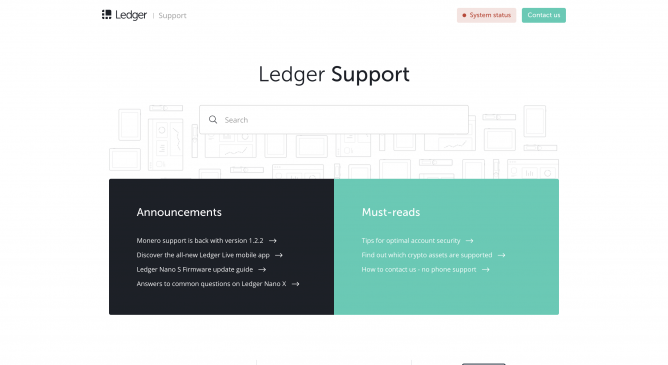 We did find that contacting the Ledger customer support was less of a hassle than doing so with Trezor, since you are first required to go through a potentially lengthy troubleshooting process before being able to use the online support form. One thing both products get right is their size, with both the Ledger Nano S and Trezor One being small enough to be easily carried around, while being discreet enough to not be obtrusive. Both devices feature a small screen and two buttons used for navigation, with the Trezor One having the larger screen, featuring a 128×64 pixel resolution. That being said, the Nano S is the smaller of the two, coming in at around half the size of the Trezor One, being similar in size to a small USB drive, though it must be unfolded to use and comes at the compromise of reduced screen size. The Nano S is made from a mix of plastic and metal, with a robust plastic interior encased by a rotating metal sheath. The Trezor One, however, is made almost entirely of plastic, making it less robust than the Nano S, but still sturdy enough to be long-lasting. The Ledger Nano S is frequently released in special edition colors, and often with a limited production run. Some of these limited edition variants include a pure white “white paper” edition; a red and white “pizza day” edition and a variety of special colorways launched through partnerships with particularly cryptocurrencies. 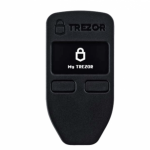 The Trezor One, however, is far more restricted in its color variations and is currently only available in either white or black. That being said, Trezor does offer a limited edition anodized aluminum variant, though this costs multiple times more than a standard Trezor One. Unfortunately, if you want to get your hands on a hardware wallet, you’re going to have to pay for it. However, since the early days of hardware wallets, the price has come down considerably, making them much more accessible, even for casual cryptocurrency investors. Therefore, when comparing Trezor VS Ledger, you won’t find a massive price difference between them. Currently, the Ledger Nano S is priced at $65/59€ including free shipping. On the other hand, the Trezor One comes in at €83, which equals around $94. Trezor does provide a reasonable discount when ordering at least three units, whereas Ledger have no such offer. Although both options are obviously more expensive than simply using a software or hardware wallet, the security and peace of mind they provide is easily worth the cost. That being said, both the Ledger Nano S and Trezor One can often be found discounted on their respective websites, with special promotions typically occurring alongside national holidays, special events, and landmark dates in the cryptocurrency industry. 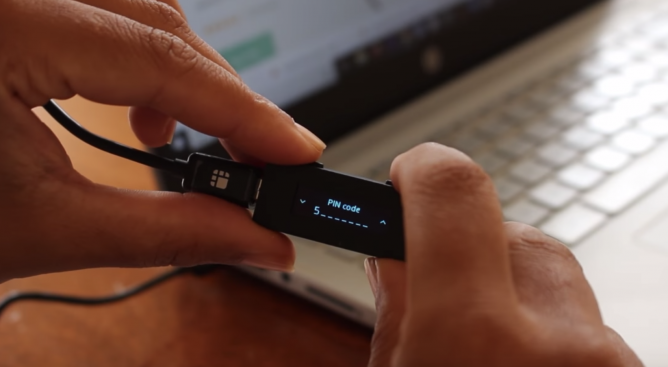 Although both the Ledger Nano S and Trezor One are frequently touted as cryptocurrency wallets designed for experts, the truth is that they are both just as simple to use as many web or software wallets. Write down your recovery phrase on the supplied recovery phrase card, and store this in a safe place. This will be needed to recover your private key if you lose or reset your device. That’s it. Your Ledger is now set up! That’s it, your Trezor is now ready to use! Overall, both the Ledger and the Trezor have a relatively long set-up process, however, this extensive process is integral to the security of these devices, and hence cannot be avoided. That being said, the Trezor process is slightly longer, so we need to give this one to Ledger. What makes the Trezor One unique? Being the first hardware wallet ever released, Trezor has managed to garner an impressive reputation among cryptocurrency users, owing to its flawless security record and rapidly developing feature-set. 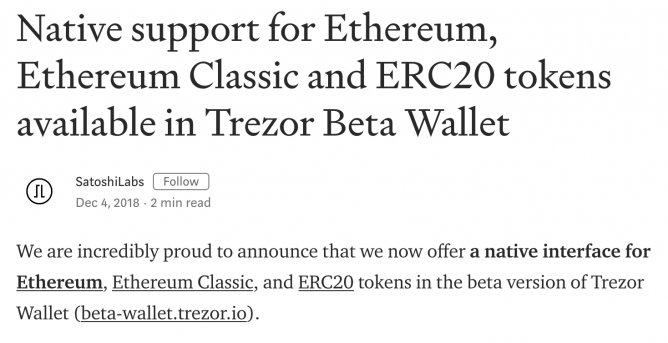 The Trezor One is also one of the only hardware wallets to natively support ERC20 tokens — which means unlike the Ledger Nano S, Trezor does not need to use MyEtherWallet to manage your tokens. The transparency of SatoshiLabs is unique in the industry, with the company pushing to ensure their entire product line is open source, allowing the community at large to bug test its code, search for vulnerabilities and help build out the Trezor platform. In fact, this openness has also spawned the Trezor bug bounty, which sees those who find valid security flaws rewarded in Bitcoins if they report security flaws to Trezor. SatoshiLabs are also particularly open when it comes to disclosing any potential security vulnerabilities of their hardware wallets, providing a comprehensive list of previous flaws, along with a technical description of its execution and what they did to correct it. Beyond this, Trezor also provides its users a means to protect not just their cryptocurrencies, but their entire digital identity via its password manager software. 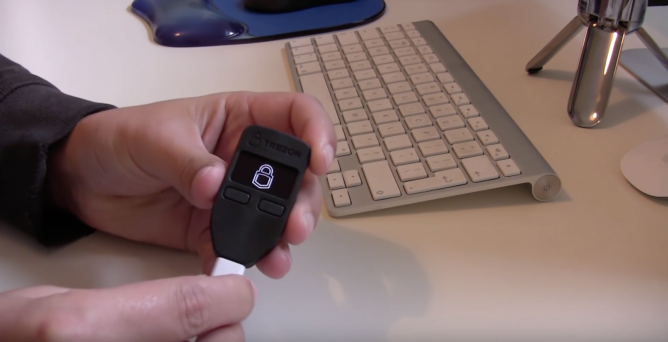 Using this software, Trezor owners can store and manage passwords for all of their most commonly used websites, with the Trezor wallet used to control and confirm access to the password manager settings. In addition, there is a sizeable community of modders and tinkerers who have taken it upon themselves to improve the looks of the Trezor, by designing and printing cases for the wallet, which can be purchased through 3rd party merchants. If you are somebody who likes to make something your own, the Trezor One might be ideal for you. What makes the Ledger Nano S unique? Not only is the Ledger Nano S smaller than the Trezor One — it’s one of the smallest hardware wallets period. This small size makes the Ledger extremely portable, allowing it to be carried in pockets, bags and wallets with ease. With just two buttons, you might expect the Ledger device software to be rather clunky, and difficult to navigate. Fortunately, Ledger has done a great job with making the most of such a small amount of real estate, with it being surprisingly easy to navigate the device with two buttons and a tiny screen. The Ledger is sold with a lanyard to connect it to a keyring, whereas some third-party merchants have also taken the opportunity to sell necklace chains for the device, allowing it to be worn around the neck as a fashion statement — or simply to keep your fat stacks close at all times. 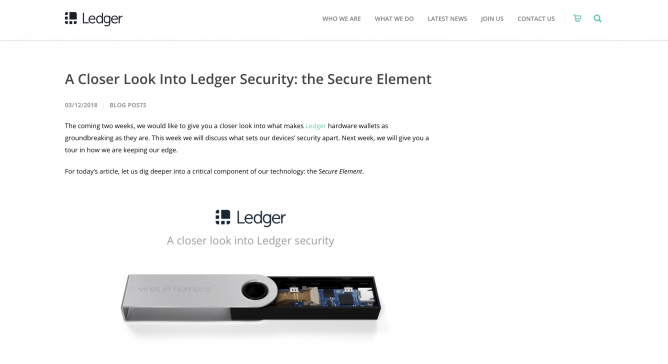 Undoubtedly the major standout feature of the Ledger Nano S is its bank-grade secure element, which stores cryptographically sensitive data, such as your private key in an off-line, isolated environment. 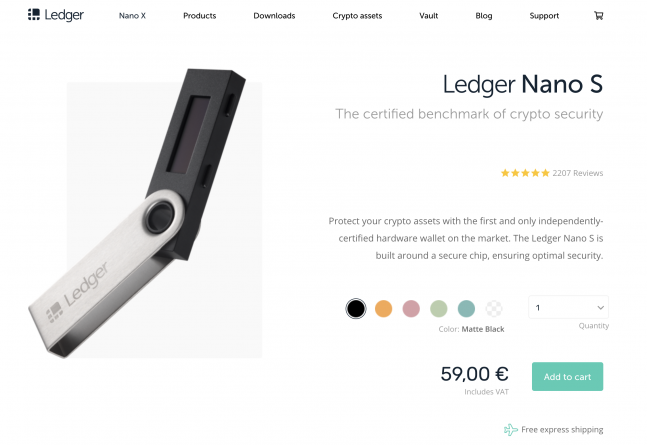 The Ledger Nano S was also one of the very first hardware wallets on the market to support this level of security, while competitors have only just begun to catch up. To date, the Nano S remains one of just a handful of cryptocurrency wallets to include a secure element. 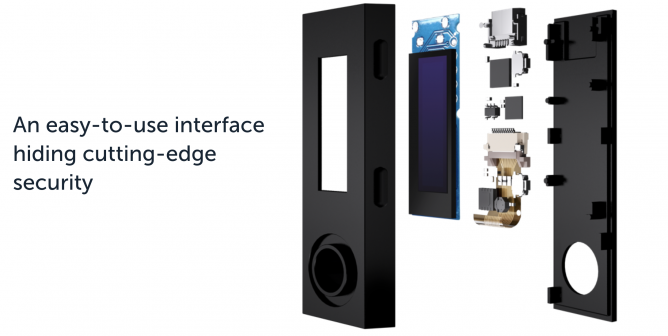 The company behind the Ledger Nano S have also done a great job ensuring that the hardware wallet is available to as many people as possible, with the wallet being sold through a variety of outlets, with shipping available to all but four countries. Arguably, one of the product’s biggest selling points remains its extensibility, with the Ledger Nano S being compatible with dozens of apps — allowing your Ledger to do much more, including unlocking your computer, sign encrypted messages and act as a device-based authenticator. What exactly is a hardware wallet? In a general sense, a hardware wallet is a device that securely stores Bitcoin (BTC) and often other cryptocurrencies on a physical device that works in combination with a computer to manage transactions. This is significantly different to regular cryptocurrency wallets, where there is no physical device involved. Hardware wallets are widely considered to be the gold standard in cryptocurrency storage, since they the highest level of security of your private keys — essentially providing immunity against all currently conceived attack types. In some cases, this excellent security can be attributed to the segmented architecture of the wallet design, which sees the private keys encrypted and stored offline within a segmented microcontroller, preventing them from being accessed from the outside. Several hardware wallets also include a verifiable source of entropy or random-number-generators (RNGs) within their security layers, ensuring that even the manufacturer cannot extract this key if it were pressed to do so. As a result, hardware wallets are able to protect users even if they are using a compromised computer, since all transactions must be confirmed on the wallet itself, preventing any foul-play from taking place. Many hardware wallets on the market are the product of years of research and development, and have stood up to the scrutiny of experts, and withstood sophisticated cracking attempts ranging from criminal organizations, right up to the FBI, coming out unscathed. Because of this, the premium pricing behind these wallets is arguably justified, and most are still inexpensive enough to be affordable for most security conscious investors. Unlike many web and online exchange wallets which appear to be getting hacked left, right and center, there remain exactly zero reported cases of a hardware wallet being successfully exploited without any coersion or social engineering involved. Why use a hardware wallet like Trezor or Ledger? Using Bitcoin hardware wallets like Trezor and Ledger come with many benefits. Let’s quickly outline some of the main ones. Anybody who has spent significant time within the cryptocurrency markets will almost certainly have heard the term “not your keys, not your coins.” This essentially means that if you don’t control your private keys, then you do not truly own your cryptocurrency. Currently, the great majority of people purchase and store their coins on a cryptocurrency exchange, essentially entrusting them with the security of your portfolio, while having no true ownership of these funds. To regain control over your portfolio, consider moving it to a hardware wallet, as this will ensure that you both truly own your digital assets, and are better able to utilize some of the benefits this brings, such as the voting rights, airdrops and dividends offered by many cryptocurrencies. 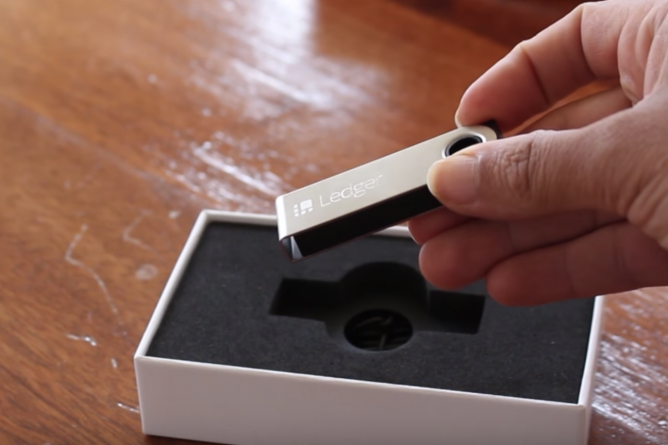 Hardware wallets like the Ledger Nano S and Trezor One provide cryptocurrency investors an easy way to secure their portfolio in cold storage — which is widely considered to be the most secure storage method available. Other wallet solutions such as software wallets, and web wallets, including those available on exchange platforms are massively more susceptible to attack, with online exchanges in particular being the least secure option. In comparison, neither the Trezor or Ledger hardware wallets have ever been compromised once they have already been set-up, making them practically bulletproof. Many cryptocurrency traders and investors handle several different cryptocurrency on a regular basis. 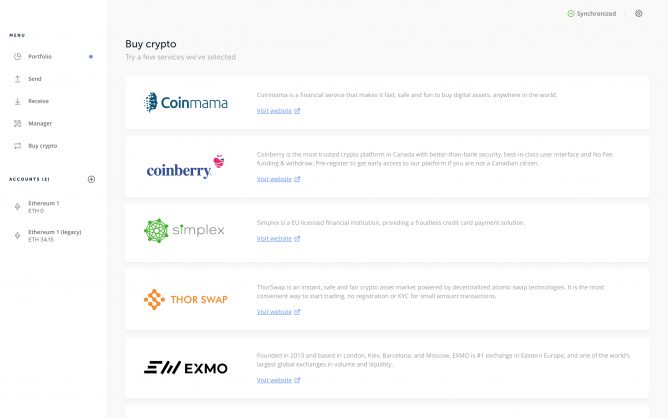 Typically, this means installing, managing, updating and working with potentially dozens of different wallet software, which can be both cumbersome and a security risk. Hardware wallets, however, allow cryptocurrency enthusiasts to store and access potentially thousands of digital assets, all in one place, making portfolio management massively more secure and convenient. This security even extends to public computers, with hardware wallets allowing users to transact on public computers without risk — even if the computer is riddled with viruses. If you are somebody who always seems to have terrible luck when it comes to your PC breaking down or crashing, then a hardware wallet could save you from devastating losses, since both the Ledger and Trezor wallets will keep your funds safe regardless what happens to your computer. Who should buy a Bitcoin hardware wallet? Realistically, few people absolutely must have a Bitcoin hardware wallet, as for the most part, they can be considered an optional expense. However, many would consider this a small price to pay for peace of mind. If you commonly shuffle between computers, or use public computers often, then owning a hardware wallet could massively simplify your life, particularly if you need to access your portfolio on a regular basis. Without a hardware wallet, accessing your portfolio on several computers can be challenging at best, or downright dangerous at worst. If you are serious about security, then you can’t get more serious than a hardware wallet. Having a secure wallet solution is particularly important when your portfolio is worth a significant sum, or if you plan to invest a significant amount in the future. Ideally, if your portfolio is over $1,000 or so, you might want to begin considering investing in a hardware wallet, since the wallet would come in at between 5-10% of your portfolio value. If you’re lucky enough to have more than $10,000 invested in cryptocurrencies, we would go as far as to say that a hardware wallet is an essential purchase. After all, a further investment of less than 1% of your portfolio value could save you from huge losses, should you find yourself in an unfortunate situation. Being a physical device with the capacity to store cryptocurrencies without any internet connectivity, hardware wallets are an excellent choice for hodlers looking to store their assets long-term, regardless how often they need to access their portfolio. Lastly, hardware wallets are best used by more experienced investors and traders — since at least in the case of both Ledger and Hardware wallets, they offer more than just the ability to store cryptocurrencies, allowing users to interact with DApps, install apps and even manage custom tokens. Should you buy the Trezor One or Ledger Nano S? That being said, please be very cautious when picking any of these 3 wallets since I have not personally reviewed them yet. Trezor One pictures by IMineBlocks. Ledger Nano S pictures by Naturalvita.